I have always loved to draw, and when I learned to apply color to my drawings, a whole new world in art opened up for me. After a career as a counselor, I started painting watercolors and soon discovered the joys of painting on silk. On white silk fabric, I paint the dyes and watch them quickly spread and become absorbed into the silk fibers for an amazing transparent and luminous result. More recently, I expanded my painting repertoire to include pastels. When I paint, I hope to recreate the way the scene reveals its sense of harmony, beauty, and happiness to me. I firmly believe that color influences mood and feelings. I try to use color mixes and combinations that are bold, lively and zesty. In addition, I want my subjects to transport me to another location – a mini-vacation in my studio. All of my work reflects things I love and have meaning to me: Italian ceramics, vintage 50’s linens, flowers, as well as landscapes of California, the Mediterranean, and the tropics. 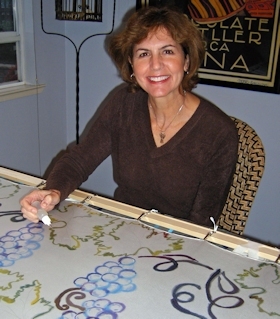 My paintings on silk have been exhibited and sold through galleries in Morgan Hill, Los Olivos, Kenwood, Capitola, and Carmel, California and are in collections throughout the U.S. and in Europe. 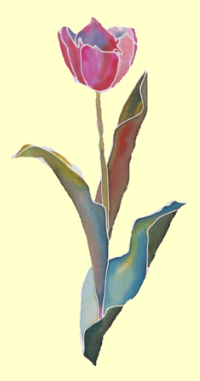 I teach silk painting at the Filoli Garden Estate in Woodside, and in Morgan Hill and Capitola. I live and paint in Morgan Hill and Aptos, CA.